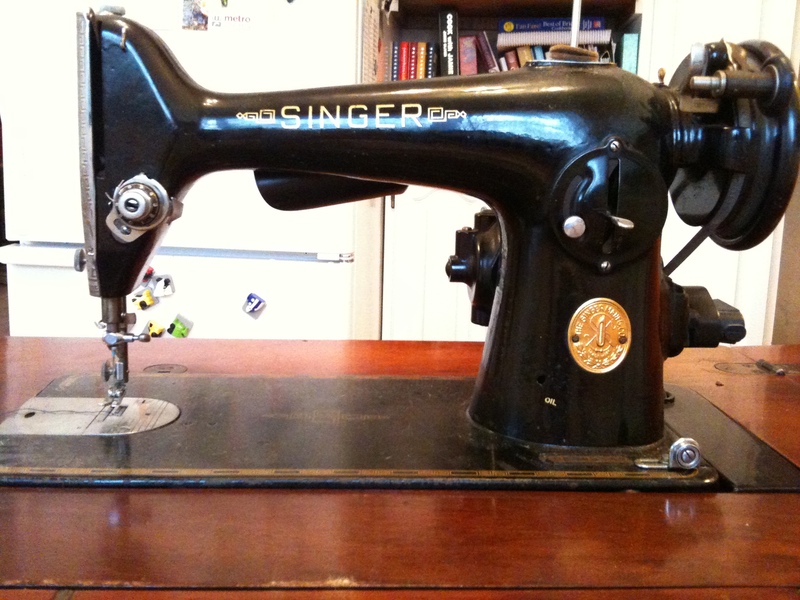 What to do with my Singer sewing machine? These are the thoughts of an avid collector and the reason shows like Hoarding: Buried Alive exist. In my defense, I have bitten the bullet and begun to purge my bookshelf… which had admittedly overflowed it’s confines and become stacked and stuffed with excellent, but unread words – hawking my beloved sci-fi/fantasy books for pennies in hopes that they would go on to new homes and new readers; admitting to myself that since the baby’s arrival, I’ve no more time to both inhale new books and re-read old. 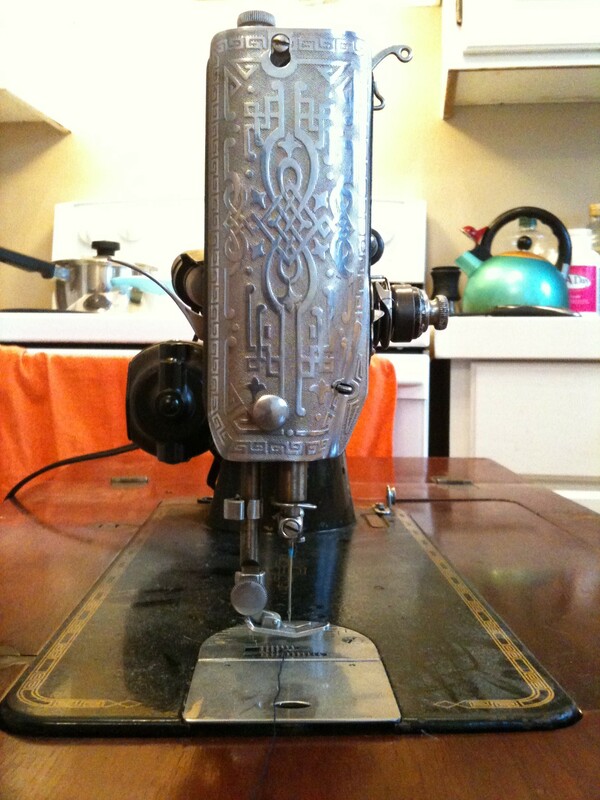 Anyways, books and bookcases aside, my Singer sewing machine sits in my kitchen and begs for a clean. Begs for a chance to be useful. I think that I shall give it a shot. Good-bye Kijiji, see you another year. In the meantime, here is a bit of good writing that I found on the International Sewing Machine Collectors’ Society‘s website. It didn’t influence my decision, but it did make me feel good about it. My conservative guess is that, between them, ISMACS members on the Internet get around 200 requests for help each week. Despite statements on their pages and on the major ISMACS web sites that requests for valuations will be ignored, about half of the mail fielded is from folk who want to know “What’s it worth”. Our members react in different ways, GF, who suffers the bulk of such mail, dumps the requests straight into the trash. Other members are more gentle and one, Dorothy Brumleve, has produced a page on her website to help those bitten by the worth bug. For other members who are approached by those wanting valuations we reprint it here. 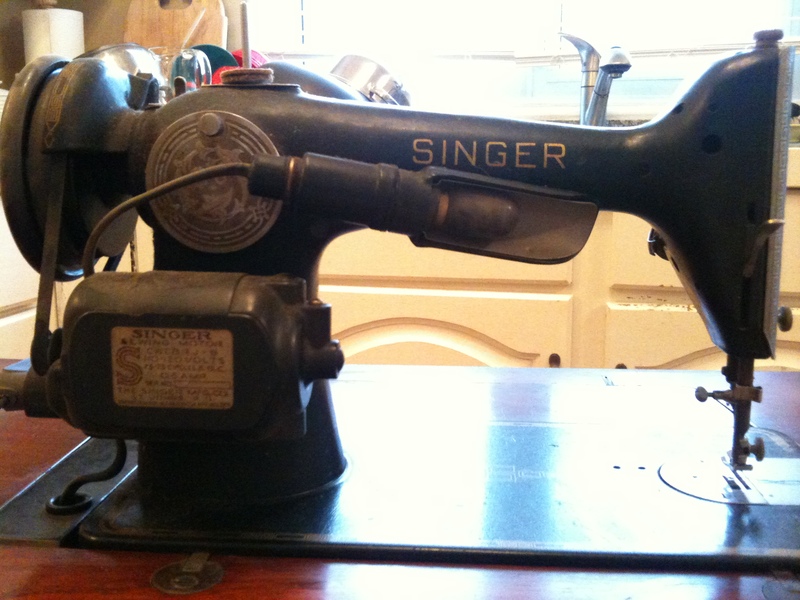 You’ve got Grandma’s Singer 127, or Mom’s Featherweight, or Aunt Naomi’s New Home treadle. And you don’ t want it. Your sister doesn’t want it. Your daughter doesn’t want it. And your daughter says, hey, that’s an antique! I bet it’s worth something! Something is more than nothing, and your machine probably is worth something to somebody somewhere. But how much? To whom? In what venue? How do you determine the monetary value of something you didn’t buy, don’t know how to use, and don’t want to keep? First, it’s important to consider the kind of value your machine might have to a buyer. Consider those qualities of your machine which will appeal to a prospective buyer. The reason for the buyer’s purchase will greatly influence the range of monetary value you might expect and may help determine the best marketing approach and venue for your sale. If it’s really your grandmother’s machine, it could have some sentimental value to someone in her family or in her acquaintance. Any working sewing machine has utilitarian value for some subset of people who sew. A pretty sewing machine with a beautiful cabinet or case may well have decorative value to some potential buyers. Included here are machines whose decoration and form provide a striking example of a period style, such as high Victorian, art deco, art nouveux, arts and crafts. Very old machines and machines which represent an important milestone in the sewing machine industry may have historical value. These would include most very early machines (mid-1800s) by both obscure and renowned manufacturers, and a few later machines. Also included under this heading are machines which have been owned by someone of historical significance, assuming that provenance can be established. And then there’s collector’s value. Most collections have a focus of some kind, whether intentional or not. A machine which has historical value will always be of interest to some collectors, but there are also those who focus on machines with decorative and/or utilitarian value. Some collectors limit their collection to a given manufacturer; in the United States, Singer is unquestionably the most-often collected brand. Some collect only hand-cranked machines, others only treadles. Some collect only very small or toy machines. Some collect only from a specific time period. Some collect machines based on the country of origin. A real “boat anchor” with little potential for restoration may still have value for its parts. Both collectors and people who sew seek out broken or incomplete machines in order to restore a better example of the same machine which is missing parts. And there are also folks who convert parts of sewing machines into lamps and cabinets and such; they are looking for parts machines, too. The potential monetary value of a parts machine will be influenced by the value of a good example of the same machine. How does all this translate into monetary value? On a given day, a sewing machine is worth what a particular seller can sell it for to a particular buyer in a particular venue. Season, geographic region, marketplace, personality, manufacturer, model, rarity, condition, history, completeness — and the reason the buyer is buying — all these factors influence monetary value. Value is not fixed, but fluid. Even so, it’s a good thing to consider that relatively few machines today command prices in the hundreds of dollars — and very, very few will bring thousands. You can always consult a professional appraiser. You’d pay a fee, of course, and there’s a significant risk that the fee would be more than the value of the machine. Here are some tips for estimating the current retail value of your machine. Professional appraisers would bring some of the same resources to this task. You can learn an approximate retail value for your machine by investing a little time in research. If you actually want to sell it at that price, you’ll probably then have to invest a lot more time in marketing. (1) Take your machine to an experienced antique dealer. How much does she/he offer you? Multiply by at least 2. (2) Find a similar machine at a busy antique store. Note the sticker price. Then ask the dealer how many years and months the machine has been sitting there with that price on it. Halve the dealer’s price for every three months it has sat unsold. (3) Post your machine on the eBay.com auction website for $9 with no reserve. Don’t misspell “sewing machine”. If your auction attracts bids, you’ll soon know what it’s worth at that time in that venue to those bidders. If it doesn’t attract any bids, it’s not worth even $9 at that time in that venue to those bidders. (4) Watch eBay.com for the sale of similar machines. Bookmark the auction pages and go back and see what the final selling price is, assuming the machines actually sell and any reserve is met. How does your machine really compare with the sold machine? Be critical! Could you take pictures as well as the dealer who sold on eBay? Could you write as good a description? Are you willing to put in the time taking those pictures, writing that description, doing the accounting, and packaging this machine for safe shipment? If not, divide the eBay price by four and go back to your antique dealer with a printout of the auction page and a counter-offer. (5) Search the web for machines like yours for sale by individual dealers and online antique malls. Note the price, and watch to see if they sell at that price. (6) Read the ISMACS News quarterly magazine for auction results. For 19th-Century machines, there’s a fairly useful rarity chart in Carter Bays’ book (The Encyclopedia of Early American Sewing Machines). It’s a mistake to rely on any price guide, but the relative rarity of the various machines in his book is fairly accurately represented. A machine that is very rare in Bays book will likely be more coveted by collectors (and therefore worth more) than a machine that is considered common. Another good source of production figures — and thus of rarity — is Cooper (The Invention of the Sewing Machine). If you discover your machine is indeed rare, I would strongly advise you to seek a professional in-person appraisal from someone who does not intend to buy the machine from you. Most 20th-Century machines were made in the millions, and most survive in great numbers. In many cases, this will hold down retail value. Some 20th-Century machine names are rare, but the machine model itself is likely to be common under a number of names. A very few plentiful models have commanded higher prices when the demand has been so great that it has outstripped even a generous supply. Most 20th-Century machines have a greater value as a piece of useful equipment than as a collector’s item. As a rule, machines made of plastic and machines made in Japan command garage sale prices. Suppose you’ve followed these steps and have discovered that your machine is worth very little money. Should you just throw it away? Not necessarily. Nearly all machines could be useful to someone somewhere for parts. Sometimes the parts will bring much more than the whole, in fact. Bedslides, cams, wheels, etc. from a 20th-Century Singer are especially sought-after, as these are commonly in actual use today and replacement parts are getting harder to find. Collectors also seek out parts machines to restore both common and uncommon 19th-Century machines. A machine owned by a family member may well be worth more in sentiment than in dollars. If you find that your machine will not bring riches, consider letting it bring pleasure instead. Even if closer relatives have rejected it, you could seek further: a grandchild, niece, nephew, or cousin might greatly enjoy a gift of your machine.